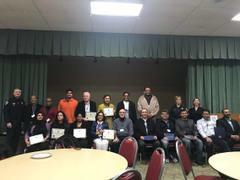 Chief Raymond Hayducka announced the graduation of 20 people from the Fall 2018 South Brunswick Citizen Police Academy. This is the seventh class to graduate since the program was restarted in 2015. Participants were instructed in a variety of police topics including criminal law, traffic enforcement, first aid, patrol tactics, and criminal investigations to name a few. Students took part in hands on training on how police process crime scenes from photographing to dusting for fingerprints. In the final practical’s, participants took on roles as police officers and applied the knowledge they learned from the class to handle various situations.